Shin Megami Tensei: Synchronicity Prologue was developed by Den-fami Nico Game Magazine’s Ladybug team in collaboration with Pepo Soft and Krobon Station (Pharaoh Rebirth). On October 13, 2017, the game was teased as an apparent fake trailer for a nonexistent game, but a few days later, the game was revealed to be real (and free). The game was made available as a limited release, beginning on October 16, 2017 to coincide with the Japanese release of Shin Megami Tensei: Strange Journey Redux and the 25th anniversary of the Megami Tensei series, with the game’s availability ending on December 24, 2017. The game stars a number of MegaTen series' trademark demons, with a Jack Frost and a Pyro Jack teaming up to take down a rogue Black Frost in an open adventure-platforming world. 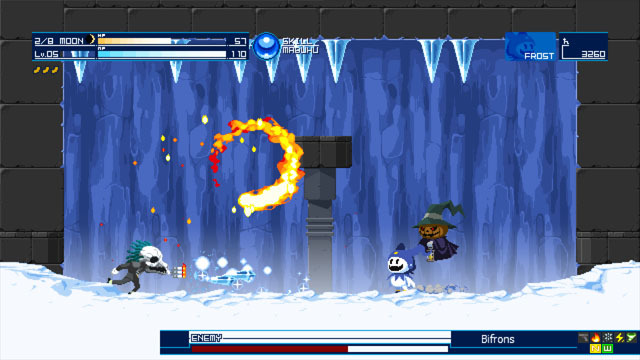 Jack Frost can freeze enemies and is immune to ice attacks, whereas Pryo Jack can fly and attack with fire, and he is immune to fire attacks. As they explore, the duo learn new magic attacks - some of which appear on optional side paths - and slowly open up the world for exploration, taking down enemies and bosses along the way. The entire adventure only lasts a couple of hours, but it's a fun and silly jaunt with charming characters and humor. Check our coverage here.